Trying to do this as cheap as I can, but if I do need a new head I'd definitely source it from him. 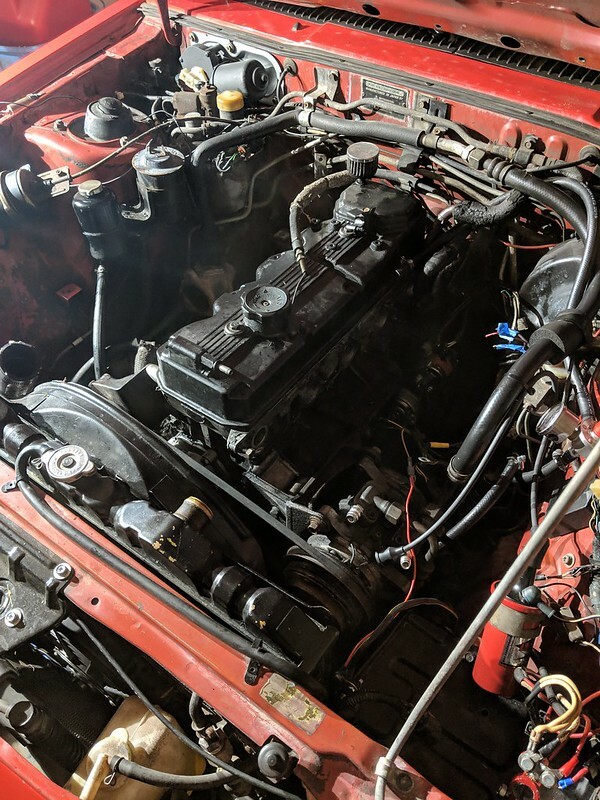 Worked on it today and got both manifolds off the motor. 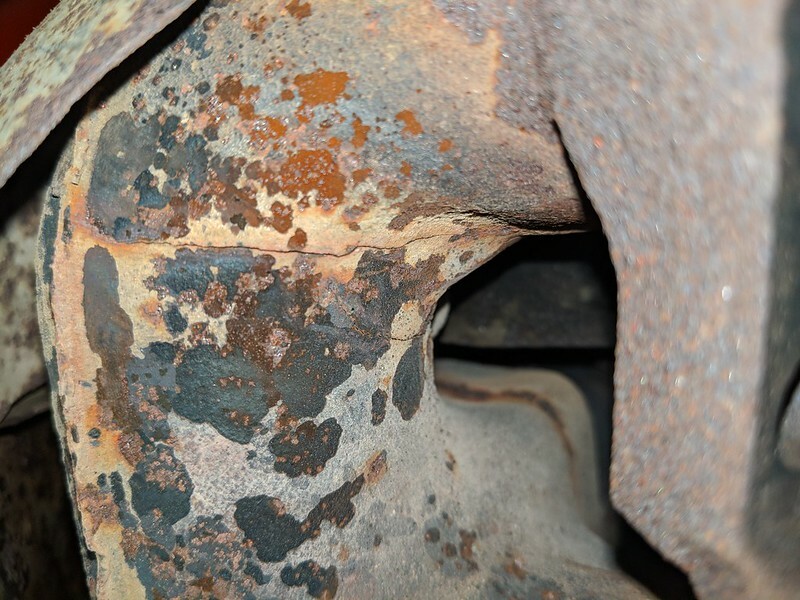 Exhaust manifold has a crack in it as well, gonna need to have that welded. I'll go into more detail with pics once I get it torn down all the way. Lots of pics incoming. You've been warned. TL;DR - Head is off. Noticed a few other issues as well. 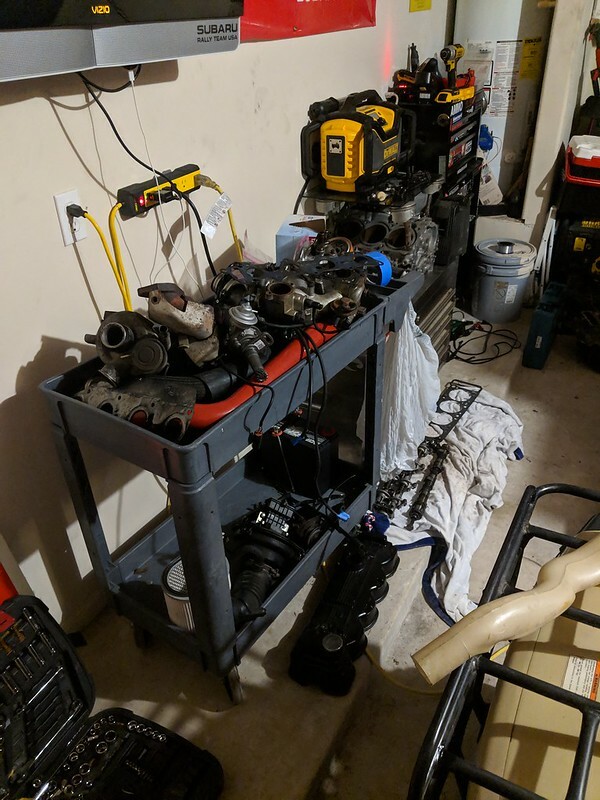 Started off by cleaning up the area around the car and optimizing everything so I can easily find tools and organize parts. Pain in the tail now but will probably save my life later. 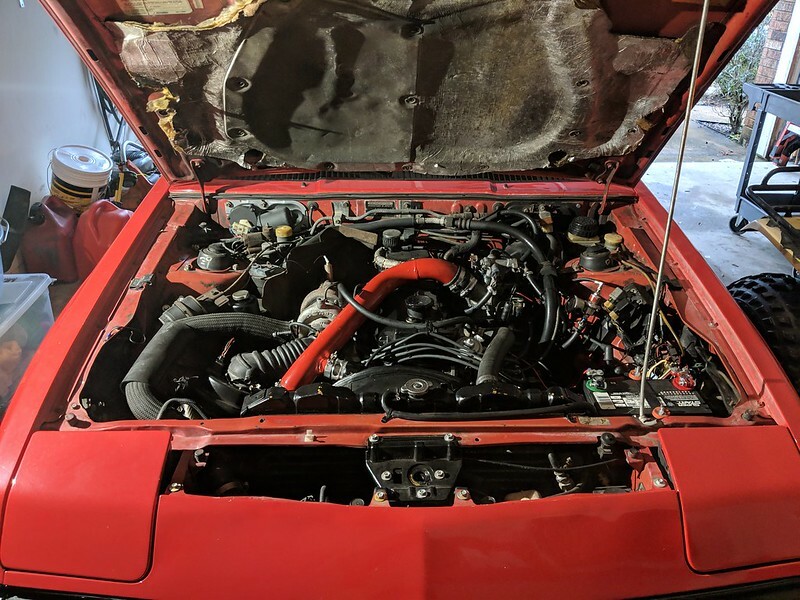 Removed air intake, intercooler piping and stuff generally in the way. Figured while I was here it'd be the perfect opportunity to re-tape and clean up this wiring mess. 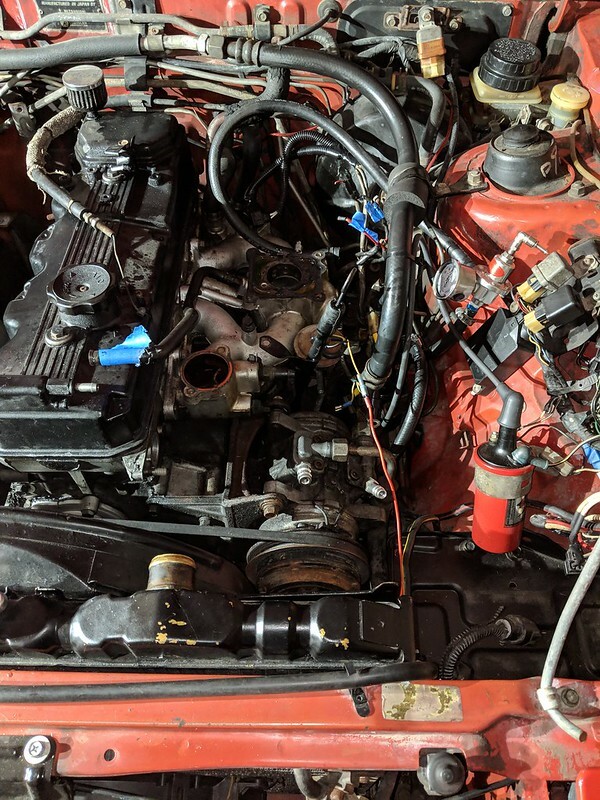 This is just the MAF harness but the intake manifold has a completely butchered harness that I will tend to later. Yes the actual clip is broken but it still connects, I'll get another if I can source one. 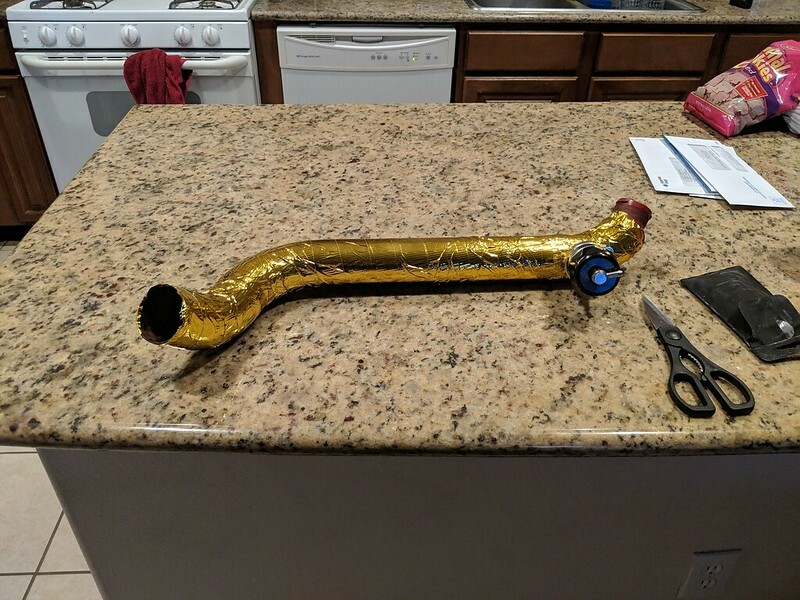 Exhaust manifold is off. Wasn't too hard, some of the nuts were hard to get to and most of them removed the stud from the head but it came off relatively easily. Surprise surprise, it's cracked. Doesn't seem bad (never noticed a leak), but I'll have it welded anyway and get this thing cleaned up. Maybe a coat of some high-temp paint. Next on to the intake manifold. This thing is took complex for it's own good. Rip that crap off. And it's off. It's complex but still pretty straightforward to remove. Just made sure to label things. I did have to contort my body in unhealthy ways to get some of those nuts off though. After that, I called it a night on Saturday. Got back into it today (Sunday). Fresh start Sunday, got the valve cover off. Only about a gallon of dried RTV was used to seal it. The cam has seen better days. Might try and source a new one. Head off. Block and cylinders look good to my inexperienced eye. Gave everything a scrape and wipe down with brake cleaner to remove any gasket material and excess gunk. 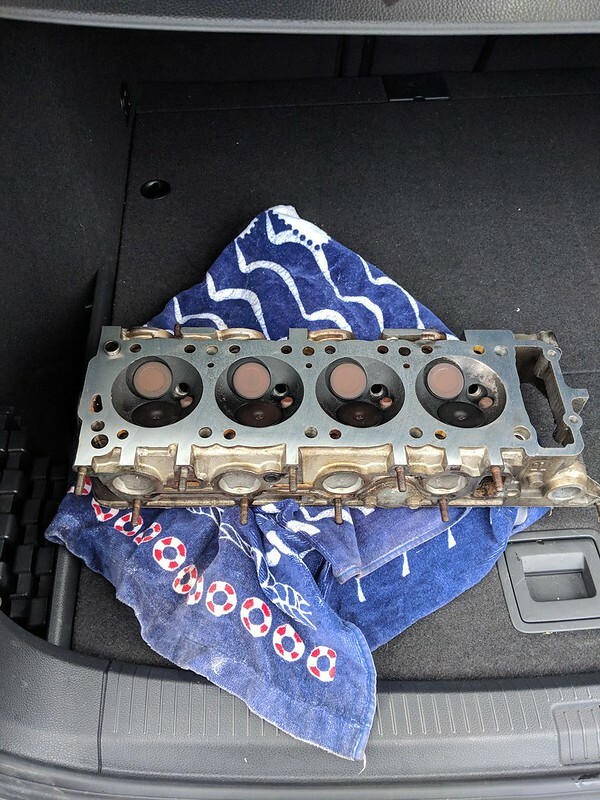 Head gasket looked fine but I'll be getting a gasket kit anyway. A little carbon-y but overall looks good. No cracks that I could find. Bonus knee shot. Please no requests for nudes. I'd consider it a success for now, especially since this is by far the most in-depth engine work I've ever done. Just need to contact a machine shop to have the head measured and machined. While I've got it torn apart I'll clean some stuff up. Going to re-do some wiring and paint some parts. I might over-do it. I have a tendency to do that. Cool man keep up w good work. Keep it going and post more pics! I'm alive and am still in possession of the Conquest for now. Full disclosure, I've been spending the past 2 months or so trying to sell the car as it is. However, nobody wants to buy a broken car so 99% of the people that contacted me flaked, ghosted or offered less than half of my asking price. Only 1 guy was serious enough to actually see the car in person. Thankfully this guy in particular seemed to know what he was looking at, and told me the head is likely warped. 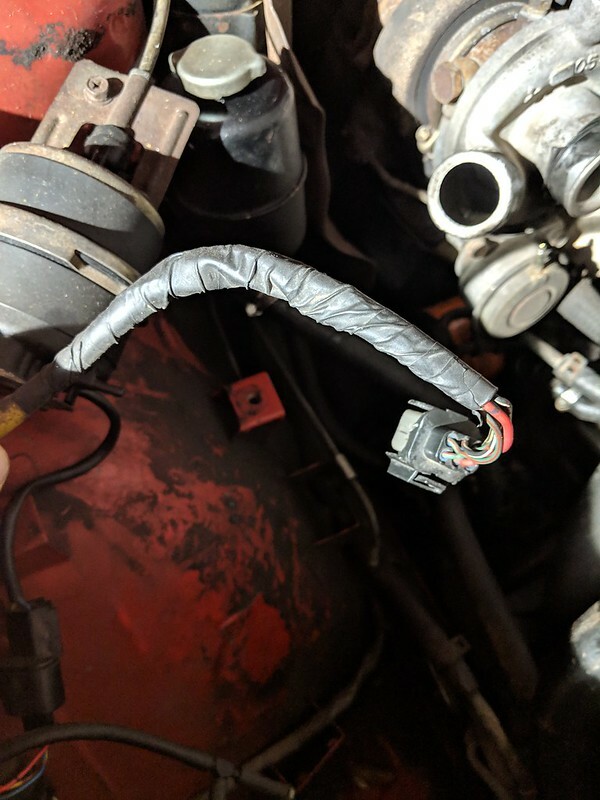 He's been looking for one of these cars and had one with the same problem, only worse. Said the exhaust gasses are leaking into the head, causing back-pressure and not allowing it to rev. Oil smells like fuel and that also explains the blowby out of the oil cap despite good compression. Basically everything he told me made perfect sense. I know the aluminium heads on these tend to warp easily, and with the weak water pump I had before replacing it there's a chance a previous owner let it overheat bad enough to cause this. I'll be starting the teardown this weekend. 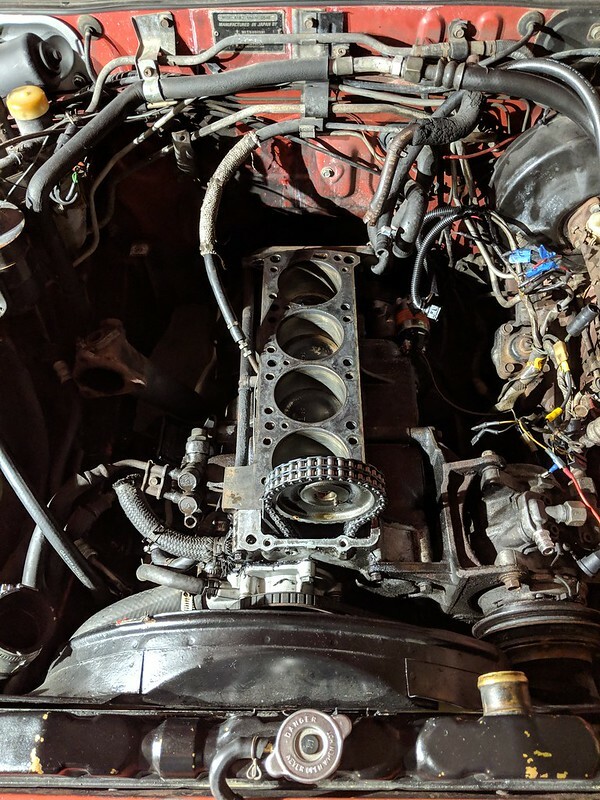 I need to fix it if I still want to sell it and not completely lose my money, and now that I have a (more) legitimate diag to go off of maybe I can do it. 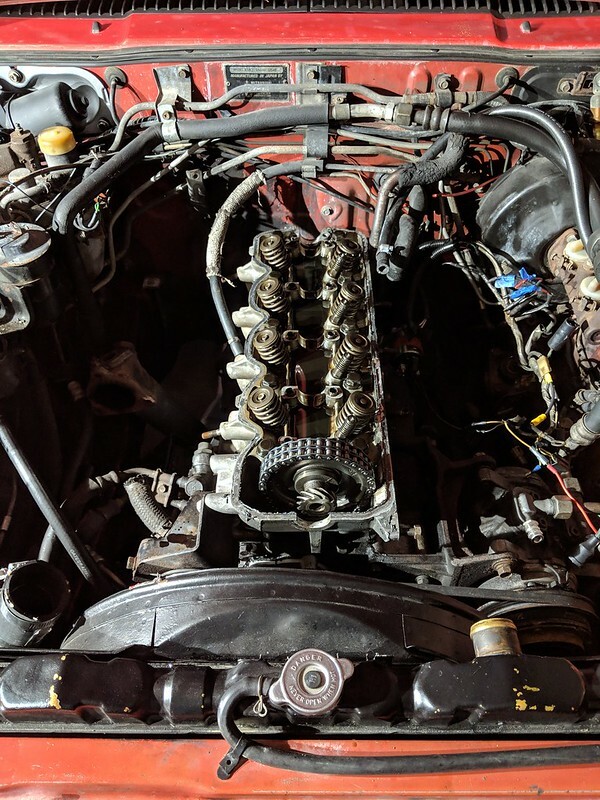 Never worked this far into a motor before but now's as good a time to start as any. 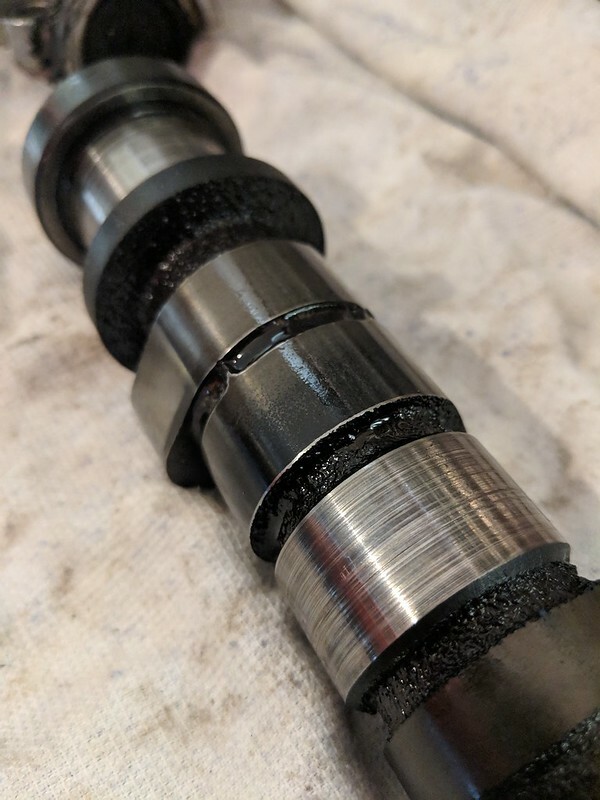 Good news is, I know a good machine shop that can hopefully machine it down for me, and if it's too far gone I know someone with a cheap motor that has a spun bearing but good head (apparently). 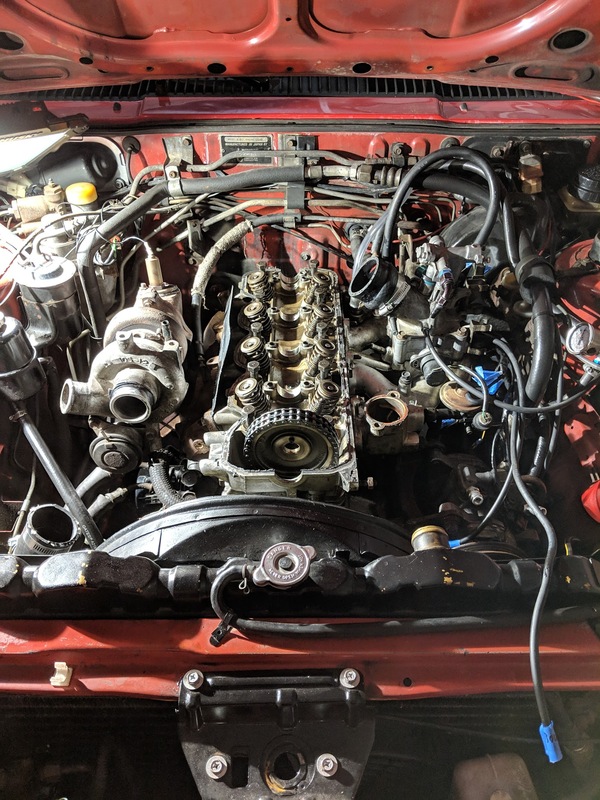 I would test the fuel pressure, send the injectors off for cleaning, and rebuild the distributor. Also test the temperature sensor and check the connector to the temp sensor. Already did all of that minus the temp sensor but I'm pretty sure the head is the issue. 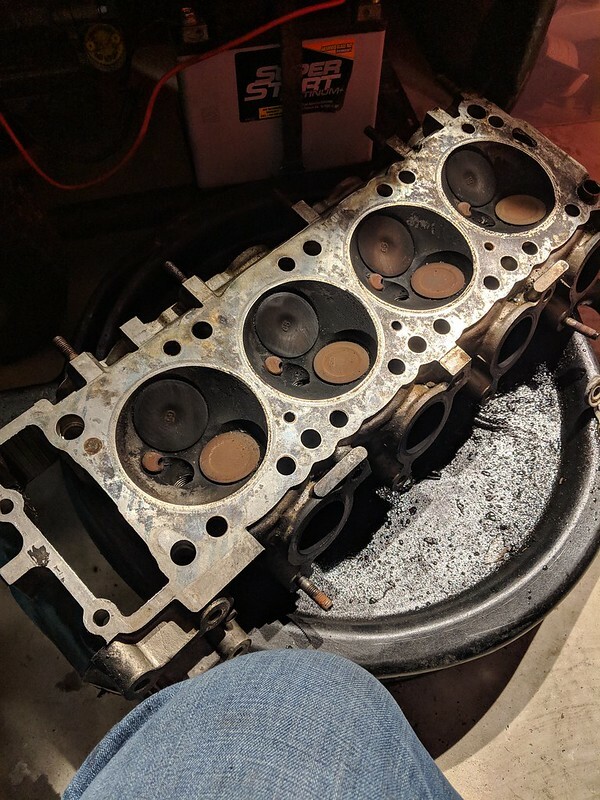 Finally got around to taking the head to the machine shop. They're business hours are exactly the same as my work schedule so I had to take a day off. Same day service at least. They had to take off .012", a little over the .008 threshold that the FSM specifies but they said it's usually not a big deal. Hopefully should be ok but at least it's straight now. Bought a gasket kit too. Every gasket for the top half of the engine. 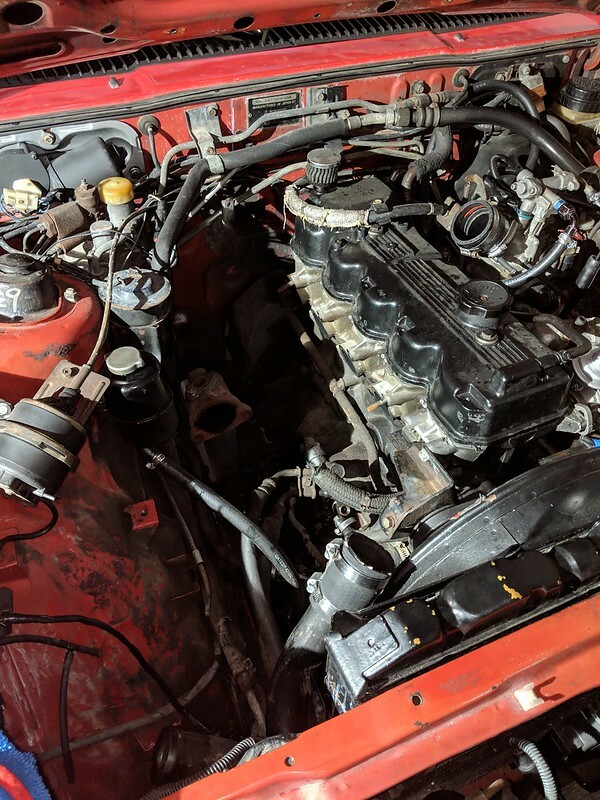 Still need to have someone weld the exhaust manifold, clean up more wiring and paint a few things before she can be put back together. Ready to have this done. Long version - I guess I'll pick up where I left off. Haven't been updating the thread but good progress has been made. 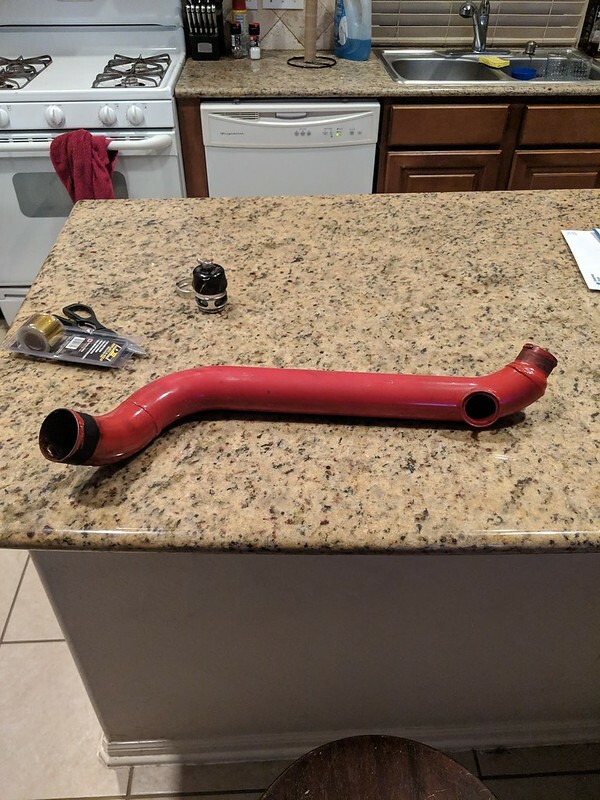 Could never find anyone that was willing to weld my manifold for a reasonable price, so I picked up a second-hand one for pretty cheap from Facebook. Wasn't perfect but definitely wasn't cracked. 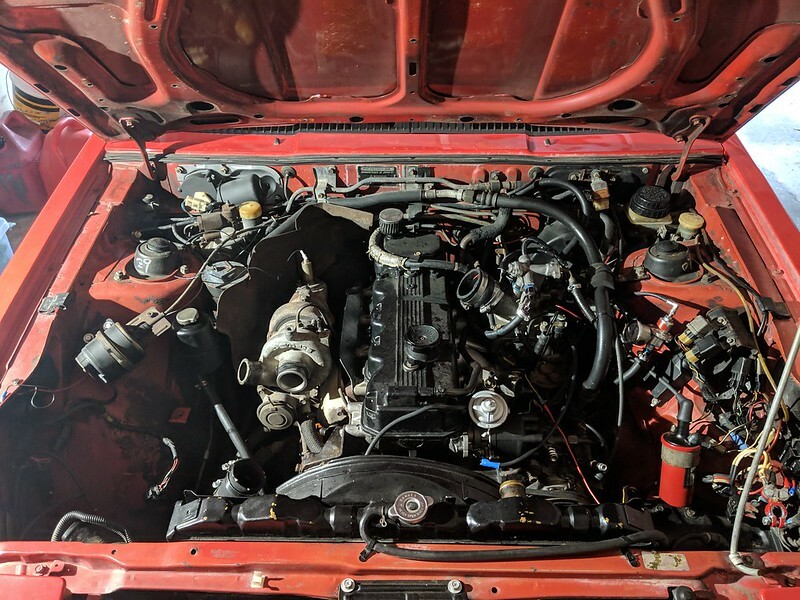 So I dedicated the past couple Saturdays to getting it back together. 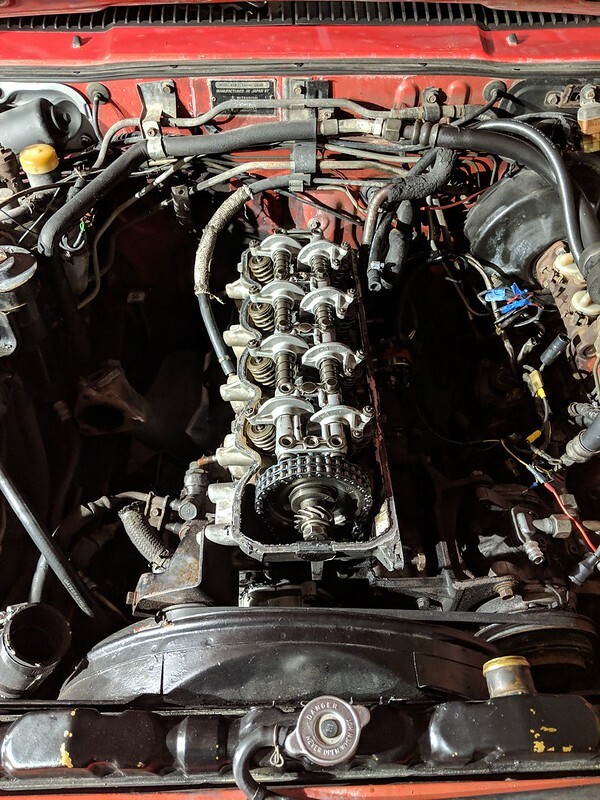 On the 2nd I assembled as much as I could without my torque wrench (had left it at work) and actually thought to put the manifolds on the head before putting the head in and it made life a lot easier. Also did a bit of cleaning up the wires but it still looks like crap. Gonna need a complete re-do at some point but it's good for now. 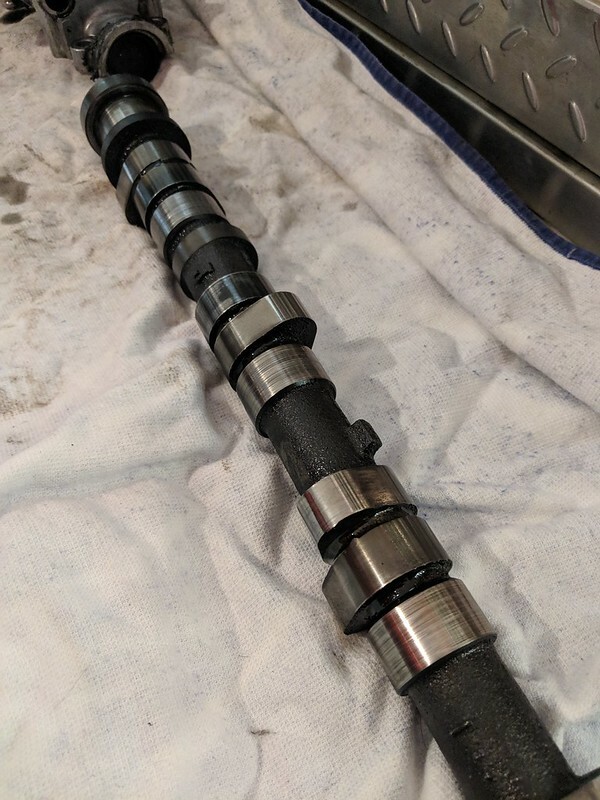 Brought the torque wrench home Monday and torqued the head down that evening. Pretty sure I did it right. This past Saturday I got back to work and threw everything together. Didn't really stop to take pictures or anything, just wanted to get it done. Everything went together pretty well. Only managed to strip out one bolt, but it's the one that holds the dipstick in place so I'm not worried. 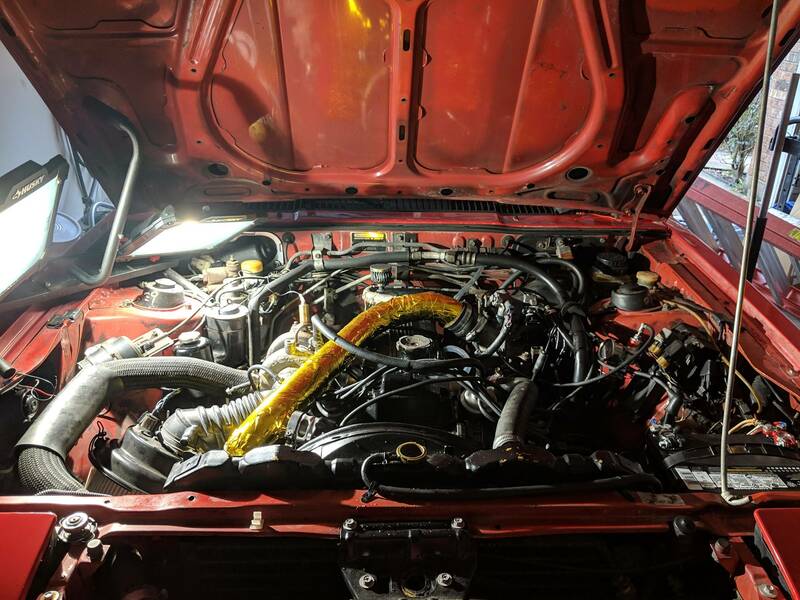 Threw in a new battery (FINALLY) and some fresh 15w40 and after some tweaking got it started and running right. Got it timed up decently and felt for blowby from the oil cap, still there but seems less pronounced than before. Funny though, I made an interesting discovery. 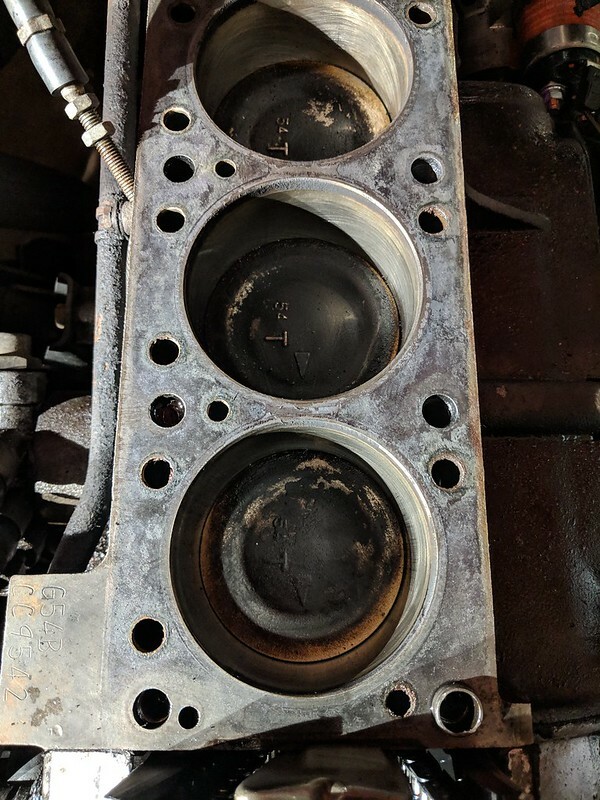 I think someone that rebuilt this engine didn't line up the timing marks properly. I say this because on Sunday, I did a little more tweaking with the timing, and at -10 I was able to replicate the same cutting out problem I had before, and after advancing it quite a bit got it to go away and run a million times better. Checked the timing with the light again and the mark was way off the gauge on the block. Would have read something like -25 and I know that's not right. 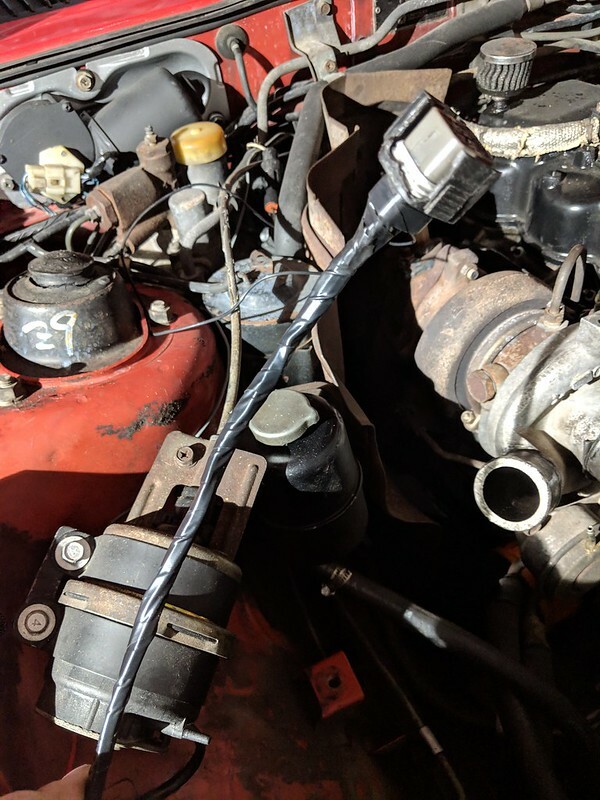 Said screw it and set it where it ran best and pretty much ignored what the timing light was telling me and it's running better than it ever has. All in all I think this may have been a timing issue this entire time, but right now it's doing better and I'm not going to question it. Not perfect though, still tends to hiccup and backfire in boost above 4k but that's something more tweaking can fix. As of now she's doing pretty well and seems to be reliably driving at a reasonable pace, and I'm happy for that. Can still get on the highway and listen to the cool turbo noises. Sunday I drove it the 10ish miles to my parent's house and made it perfectly. I'll try to drive it this week and one day take it to work for an inspection, since the reg has been expired since August LOL. 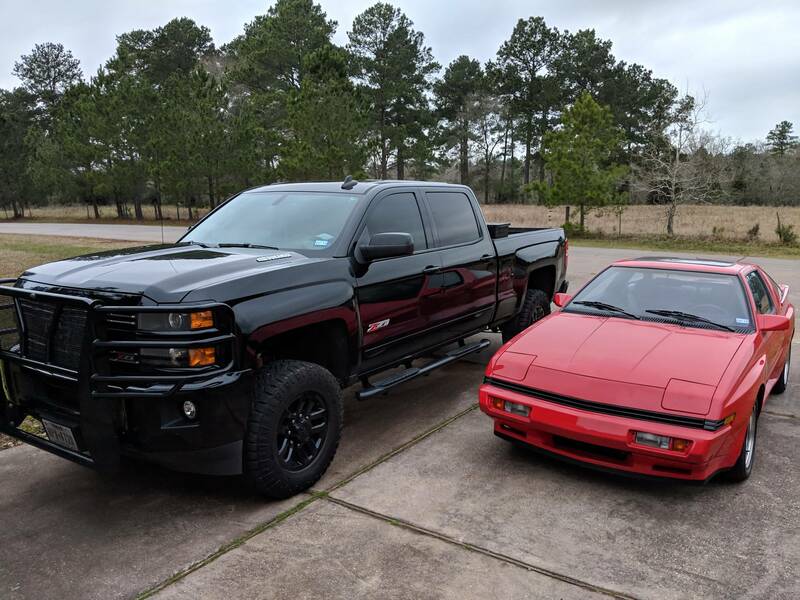 Next to my step-dad's Duramax. The Quest looks tiny. Altogether I'm happy she's up and running again, but we still have a lot of work ahead. 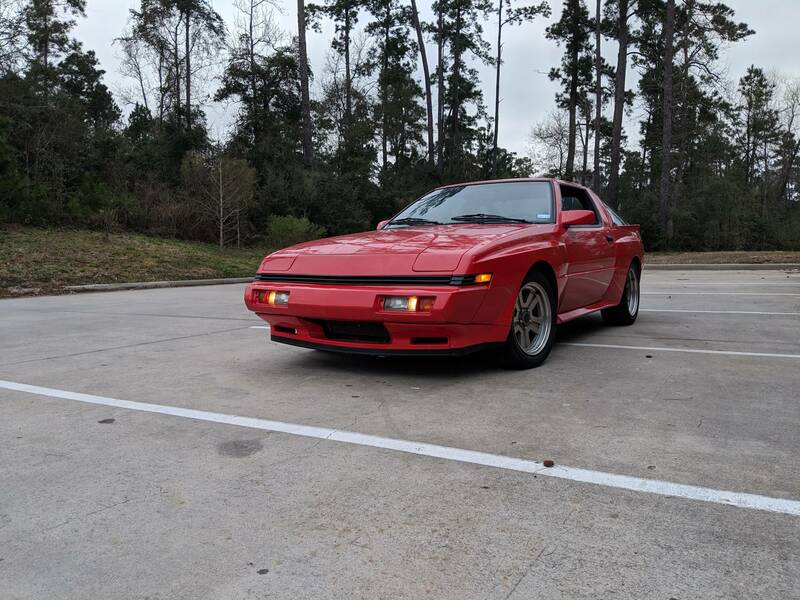 As for plans, I need to get it registered again, need to clean it (never actually detailed it before, hard to believe if you know me), and need to clean her room (the garage). Gonna throw in a few parts and tinker with some stuff to try and clear up those backfires. It sounds like you have a vacuum advance/distributor issue. The weights could be sticking or the advance itself isn't working smoothly. By clocking it and advancing timing to make the issue go away isnt correctly fixing the issue, just masking it. These engines are very easy to time. Pull the valve cover. Check mechanical timing and while the cover is off, reinstall the distributor and making sure it is clocked properly. Then recheck timing with a light. My vacuum advance and distributor was faulty when I first got mine running. Would buck and backfire in boost. Cleaned the distributor, replaced the advance, and redid its wiring and was good to go.